Some craft projects are quick and dirty. This is one of those projects. It is designed to fill a need rather than an aesthetic. For a while, I’ve needed a solution to keep my earrings handy. My little idea turned out just fine. Why orange tulle? Clearance. I’d bought something like 10 yards – the remainder of a bolt – at Joann’s a long time ago. I’d wanted to experiment with the material without paying full price and hadn’t gotten down to using it yet. Still plenty for later. I considered hand sewing, but ultimately used a zigzag machine stitch. Simple and quick. It would be possible to do a prettier version suitable for gifting, but for my fumbling in the dark to find accessories, it does nicely. Anyone else have quickie craft solutions lurking in corners? I originally finished this project in January, uploaded the pictures, and created the draft for this post. I intended to post. Something about January and August that makes me think of blogging. January is the “clean slate” effect the New Year brings. August 17th is my birthday so I’m contemplating the existential things in the dog days of summer. Who am I? What progress have I made? Where am I headed? And the biggest question of all: Why have I paid hosting for a blog and not published in eight months? I am always torn between by impulse for privacy and the desire to be known and understood with a generous side of not feeling like I or my work is ever good enough. I don’t say this as a play for pity or bait for complements. I am not unique in my feelings of inadequacy and uncertainty. I know my strengths and my stumbling blocks. I struggle with physical and mental health with sometimes nothing left after doing what has to be done vis-à-vis the requirements work and life. Yet I feel like I should push myself harder. I’m sure it’s difficult for most people to understand why the pictures of my little sewing project musings on my well being. Yet my brain makes the connection between a perceived failure (both in quality of what I made and not posting sooner) and every single unsolved problem in my life, past, present and future. Not useful, but welcome to depression/anxiety thinking. So as a small symbol of defiance, I’m posting. I’m not happy with how the pictures turned out on this project. I didn’t iron it again before putting it back on my dressmakers dummy. I didn’t take the time to get a good shot of myself wearing it. Funny thing is this garment is only a mock-up for a version of it made from a small piece of fabric left over from a skirt made from thrift store pants. I finally finished the “real” project a few weeks ago, but that is a post for another day. It’s shameful how long certain unfinished projects have languished in boxes, bags or piles. This is to say nothing of supplies purchased and stashed for later use, some with intended ends and some without. I don’t think of those as unfinished as much as un-begun. I am working on finishing up some of these objects begun long ago with such enthusiasm. Abandoned, but perfectly good ideas. I say this to differentiate from a scrapped projects. It’s one thing to quit and another to never get back to a bit of work. It is as of my creativity gets held hostage with intentions to complete a project. Finishing, even with imperfect results, is the only way to make progress with skills in the arts. I was reminded of this, weird as it’s going to sound, by Guardians of the Galaxy Writer/Director James Gunn who some time ago posted on his Facebook page about how he didn’t start to have success with screenwriting until he buckled down and finished what he started. He’s not the first successful creative type I’ve heard this from, but somehow hearing it from a guy who really knows how to put together a mix tape stuck with me. It’s true: Twenty first halves aren’t anything compared to one whole. Even if the whole isn’t fantastic, learning from the process is invaluable. Irreplaceable experience you can’t get any other way. The photo above is from an ambitious project I began at least two years ago using embroidery and applique techniques. The design came from Doodle Stitching: The Motif Collection: 400+ Easy Embroidery Designs . I enjoy Aimee Ray’s designs because they are modern and not too “crafty” looking. When I saw this particular drawing in the book, I knew something would have to be made from it destined to go live with someone who’ll appreciate it. Until it is done, it is private. One simply doesn’t post spoilers on the internet. I was inspired as well by the knowledge FedEx Office will print stuff as big as your imagination. I blew up the images from the book, got two copies: One for cutting a pattern and one for reference. My fabric stash of odds and ends I’ve picked up for doll clothes or other small projects became the crayon box for filling in the pictures. Working with different textures, colors and patterns in fabric gets my creative juices flowing like nothing else. I had a ton of fun digging through my boxes of scraps to find the right combinations. It may be a while until this project is complete. It’s around half done with a few variables still in how it’ll be finished. Embroidery is an ideal TV watching project. I’m enjoying the process and happy to be back at it and looking forward to being able to share the results. I made this batch of doll clothes in May. I took pictures with the intent of documenting them on the blog, but as so often happens, I didn’t do it right away. If I were all smooth and slick, I wouldn’t have mentioned how old these pictures are, but, hey, we’re all about honesty that makes me look like a slacker here at NerdBliss. The important part is that I promptly mailed them to Sabrina, my BFF Kate’s daughter, my niece and owner of an American Girl doll. Since her birthday is close to Christmas, I thought it might be nice to send a summer vacation care package, plus any reason to both use my stash of remnant fabrics and shop for additional pieces or patterns. Hounds tooth skirt, navy leggings, camisole. I had to make the cami to bridge the weird gap in the ruffle shirt. Not sure why the pattern was designed this way. 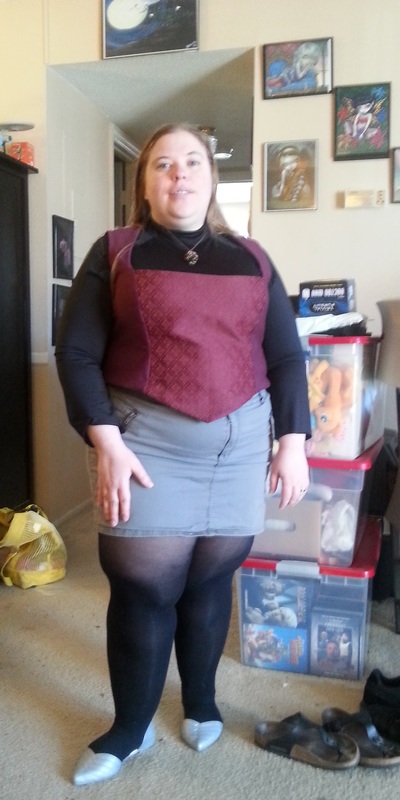 I made the vest reversible since the lining – made from Klingon wedding scraps – was too pretty to waste. The reversible part wasn’t part of the pattern, but it was simple enough to tuck in the seams where the front and back connect under the arms. The hat sells the look. Sadly, I didn’t get a better picture. Real leather boots. They were a hassle to sew. I winged it on these, but they came out well enough. I was on a mission to make shoes since learning Sabrina’s doll only had one pair. Unacceptable even for a plastic girl. Nothing like a project I can start and finish within a few hours. And nothing like bears in pajamas. The bears in question belong to my friend Alex‘s nine year old daughter. The big guy is “Upstate Bear” and his little friend is “Daisy.” They’ve been waiting patiently on our love seat since January to have custom sleepwear fitted. I’d originally made a set for Upstate Bear with an 18 inch doll sized pattern, but that was without laying eyes on the fluffy fellow. When I had Alex bring him over to measure for a hem, we found the whole thing would have to be bigger, but I had to launch into work on our Klingon wedding costumes before reworking the PJs. Little did I know it would take four months to complete all the Klingon wedding stuff or that I’d be sewing the night before the convention and talking a hand-sewing bit for the car ride to Atlanta. I was so relieved to have a small project to jump back into after we got home. But first, I moved our sewing area from the dinning room into our office and put my desk in the dinning room. Crafts breed chaos. When you have a connected living/dinning room, working on a big, long project out there makes it feel like we don’t have a living space at all. I will eventually post pictures of our sewing room when I’ve got things set up how I’m envisioning. I really want a giant spool and bobbin rack, an cork board and maybe a peg board to hang our fanciest tools on. When I finally sat down to make the pajamas, I wasn’t sure how well the skills I learned modifying patterns for our wedding garb would translate to working with dolls and bears. Let me tell you, it’s much easier to work with a bear than a person. And the pattern shapes are much simpler. Measure the waist, cut the pants pattern down the middle, tape in some of the cool giant graph paper we’ve got and presto, it fits. The shirt is a little more in depth to explain without diagrams, but a cake walk compared to fitting the bodice of my dress, for sure. The little pair needed only to be shortened. I used a Ken doll sized patten and it was perfect. I’m proud of myself for learning a skill I’ll hopefully be applying for years to come for costumes, dolls & toys, and possibly even day to day wear clothes. Without being to cocky – the seam ripper is always handy for a reason – I feel like I’ve got the basics down. For someone who never had hobbies before besides reading and writing which, at the core, are basic skills everyone learns in school, it’s a darn good feeling. Upstate Bear and Daisy went home a couple days ago. I hear their owner is very happy with the results. Without a doubt, that’s the best part. Forgive any formating weirdness on today’s SPS. I’ve just now downloaded the WordPress app for my spiffy new Andriod phone. I’m hoping having easy access to my blog on the go will allow me to use those little moments of down time to post or at least open drafts when I have a brillant post idea. Today, I’m at work earlier than I have to be. Such is life without a car of my own. It doesn’t happen often and if I use the time to read or write, I’m perfectly happy to spend a few hours in the breakroom, drinking coffee. My portrait is yet another Klingon wedding project photo. This time, the sash is for our friend Alex, who’ll be serving as a sort of best man. There is a Klingon word for it, but as I’m not at the computer, I won’t trouble with looking it up now. Maybe blogging from my phone is the best idea ever. Fewer distractions and more typing away. The sash took more effort and thought than it looked like. I’ve got a layer of interfacing and a layer of muslin between the satin front and cotton liner. I first sewed the interfacing to the lining and the muslin to the satin so I only had two pieces of fabric to handle. Then I sewed the wrong sides together, creating tubes, turned them right side out, before sewing the front and back together. In writing that out, I wish I’d taken pictures of the process. Ah, well. There will be other sashes, no doubt. Klingons are big on honor sashs. I’ve mailed out my niece’s birthday package today. It won’t make it in time for her birthday on the 19th, but I’m hopeful it might arrive for her birthday party on Saturday. If not, well, it’s like an extra present after the fact. I feel a little better than it’s handmade goodness I’m tarty with rather than a store bought gift. I shared pictures of the tote bag and coat here last week. They are made to fit 18 inch dolls, specifically in this case, Sabrina’s new-at-Christmas American Girl doll. I planned to mail yesterday morning, but I had a few struggles. More experience with the seam ripper. The dress was a little tricky. I haven’t figured out how to best handle gathers and the whole bottom is gathered. I also ended up ripping out a bit of one of the sleeve where I bunched the body of the top up under while stitching. I’m hoping such complications won’t be as hard to avoid in people sized garments. I am planning, assuming Sabrina continues to be interested in the doll, to get myself a “fit model” in the form of a cheap doll in the right size. It nothing else, I’d be able to use it for taking pictures of my projects. I took a picture of the underside of the dress because it shows how the gathers create the “bubble” effect in the skirt. Actually rather fashionable right now. I have mixed feelings about the look on full grown women, but on little girls and dolls, it’s adorable. It’s perfect in the striped fabric from my remnant stash. By the way, I’ve found the best prices on remnants at Hancock Fabric. Buying gobs of them at 70, 80 and 90 percent off regular price makes it really fun to match up with appropriate patterns. The other thing I’ve used for doll stuff is fat quarters marketed for quilting. The fabric for the sleeping bag came from All About Fabrics in Williamston, South Carolina. They’re outlet open one weekend a month in the warehouse end of a textile mill. It’s epic, folks. Huge bolts of fabric, much of it upholstery fabric, and lots of odds and ends. Totally worth a day trip for anyone who’s interested in costuming, for sure, but I digress. The sleeping bag represents two sewing milestones. I’d never worked with any stretch fabrics on the sewing machine before and avoided them for the most part while hand stitching Barbie clothes. I bought the end of a bolt of this stuff because I love it. The pictures don’t do it justice. In person, what looks like pink is red and the whole thing is far more bold. I have plans for something… maybe a couple somethings… out of the stuff for my wardrobe, but it seemed just right for this project. Zigzag stitch is pretty awesome. 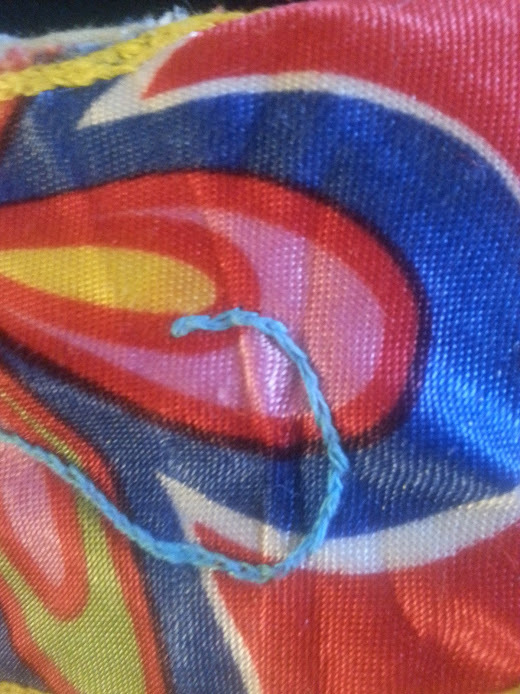 After sewing the “batting” to the stretchy stuff, it was much easier to handle. I even used the zigzag for the zipper and sewed it in without a zipper foot. Proud to say, no seam ripping was required and it actually zipped. I hope Sabrina enjoys playing with it all as much as I enjoyed making it with none of the frustration I experienced in their creation.